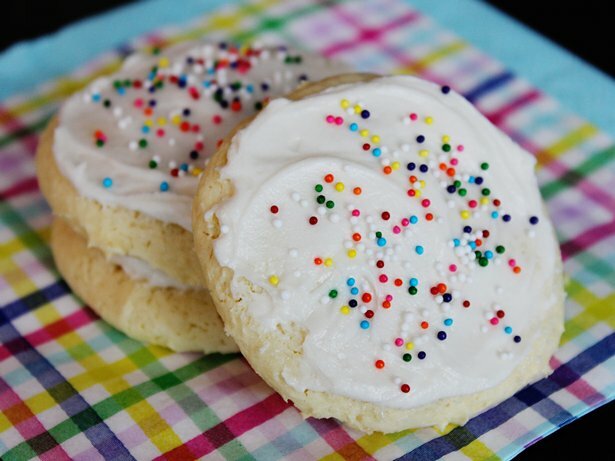 Check out this recipe for "Cake Mix Sugar Cookies". Melt in your mouth sugar cookies with a simple and easy frosting! Heat oven to 350°F. Line cookie sheets with cooking parchment paper. In large bowl, stir together cake mix and flour. Add oil, sour cream and eggs; beat with electric mixer on medium speed until blended. Using 1-inch cookie scoop, shape dough into 1-inch balls; place on cookie sheets. With bottom of drinking glass dipped in sugar, flatten balls of dough (dip glass in sugar for each ball). Bake about 10 minutes or until just about set. Cool on cookie sheets 1 to 2 minutes; remove from cookie sheets to cooling racks. Cool completely, about 15 minutes. In medium bowl, beat Frosting ingredients until smooth and fluffy. If too stiff to spread, add a few more drops of milk. Frost cooled cookies; sprinkle with decors. These have a tendency to overbake quickly so keep an eye on them. As a timesaver, you can always use any flavor of Betty Crocker® frosting as a substitute for making your own.